And so we reach the end of our Rick and Morty coverage from Funko, with the final figure in the first series, the Build-a-Figure Snowball. "Wow! A whole world populated by intelligent dogs. I wonder what it'll be like, Rick." "I think it will be great, Morty. You know, it could be developed into a very satisfying project for people of all ages. I mean, I'd watch it, Morty, for at least 11 minutes a pop. You know, maybe they'll do it board-driven." "You know, that's a real comforting idea, Rick." "What do you know, Morty? What do you know?" 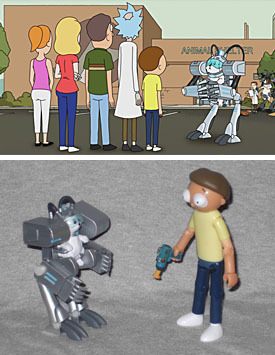 I sound like a looping record but scale is really where this line has problems, even beyond the issues with articulation and paint; Snowball here is sadly out of scale with the other figures, at 3½"; in the episode in question, Snowball's mech suit is nearly as tall as the family members, essentially towering over Morty, but here he's shorter than him. I have no idea why it came out this way - budgetary reasons maybe? - but this certainly makes him less appealing as a figure, and as a Build-A-Figure extra, which is a shame, because the sculpt here is excellent. 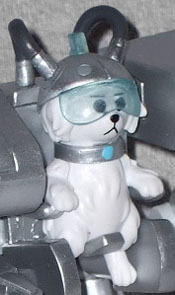 Funko have done a great job bringing the little big guy to life, making an excellent plastic rendering of the adorable pup and his robot suit. For whatever reason, the paint on Snowball is stellar, especially compared to the other figures in the line, with minimal overspray or slop anywhere. It's really cool, and while he doesn't look great alongside the other Rick and Morty toys, he looks amazing alongside, say, NECA Godzilla toys, or Mezco South Park, or anything like that. Things from other properties. 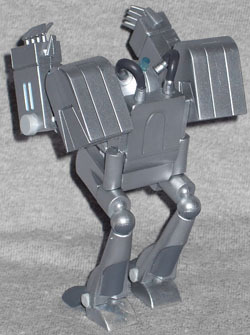 As a hopped-up accessory himself, Snowball doesn't include any extras, and his articulation is sadly lacking. 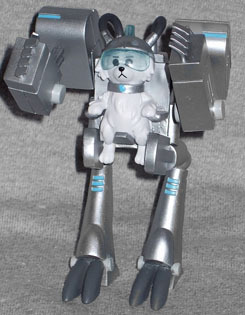 For one thing, the dog doesn't move at all - his only real movement is at the arms of the mech suit, which are a basic swivel-like joint. There is the most minor amount of movement in the upper legs, but they're blocked by the sculpt and don't really count, which is kind of to help keep the little guy on his feet. And unfortunately, that's it; Snowball wasn't the most active character in his episode, as essentially a sight-gag, but it feels a little lacking that this is all the movement he gets, without even a mock-balljoint to allow him to properly swing his arms around. Swivels in the forearms, hinged in the fingers and toes, that kind of stuff. Where is it? 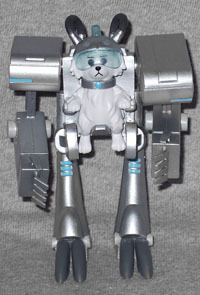 And if you really want to impress us, make the dog removable from the exo-suit, so it can stand on its own. Or he can. Or both. And so we reach the end of what is hopefully the only the first series of Rick and Morty figures - the first of many! I definitely have qualms with this series, especially in regard to the scale, but it's still a nice little line, and well-priced. I recommend it to fans, and hope that we soon see more Funko Rick and Morty action figures.